How do I remove blank spaces in a generated document? It is easy to remove blank spaces in an automatically generated document using JungleDocs. In this tutorial, you will learn how to do this. 1. Select the whole row. 2. 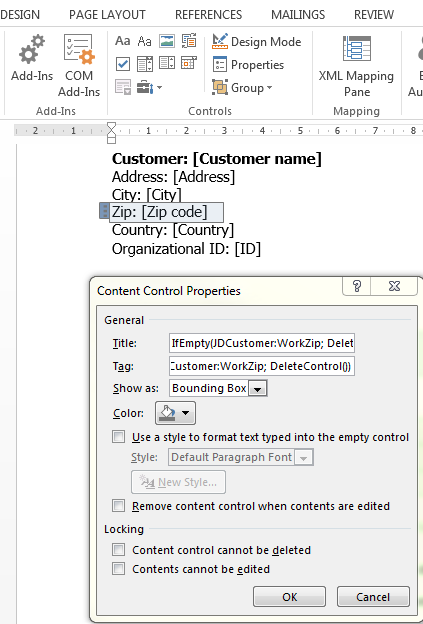 Insert all selection into Rich text content control and configure its properties. 3. Use both IfEmpty() and DeleteControl() functions in the content control Tag field. 4. In the generated document this row will be deleted automatically if the Zip code field for a specific customer is empty. Want to find out more about the DeleteControlIf function ? Then click here.